Speciality Shoulder and Knee Arthroscopy, Sports injuries, Paediatric Orthopaedics, Complex trauma. Dr.Karthikeyan after completing his undergraduate and postgraduate degrees in reputed Government Medical Colleges in Tamilnadu, joined as a Registrar in Ganga Hospital, Coimbatore , during this period (2011 - 2014) he has undergone intense training in Trauma surgery , Joint Replacement and Paediatric Orthopaedics. Subsequently he has done his Fellowship in Athroscopy from reputed institutes in Hyderabad, Manipal and USA, where he had the opportunity to work with some of the doyens of Arthroscopy. 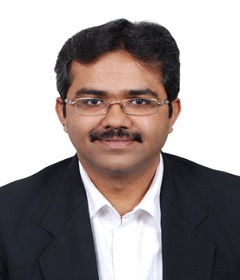 He has also worked as an Assistant professor in the Department of Orthopaedics at PSG IMSR,Coimbatore. He is one of the very few doctors in this region to have the prestigious Diploma in Sports Medicine degree from the International Olympic Committee. Being a sportsman himself he is passionate about sports injuries and is well versed with key hole surgeries of the knee and shoulder. Diploma In Sports Medicine - International Olympic Committee. Life member of Tamilnadu Orthopaedic Association. Life member of Maharashtra Orthopaedic Association. Life member of Indian Arthroscopy Society. Knee Arthroscopy - ACL Reconstruction, PCL Reconstruction, Meniscal Repair, Multiligament injuries. Shoulder Arthroscopy - Bankart Repair, Rotator cuff repair, Capsular release, Subacromial Decompression, Biceps Tenodesis. Complex Trauma - Pelvi Acetabular surgeries, Compound fractures, Intra articular Fractures. 1. AA Mehta Gold Medal - Presented a Paper titled “ Femoral Head Fractures – Revisited” for the prestigious AA Mehta Gold Medal category at IOACON 2013. 2. Presented Poster titled “Shepherd Crook Deformity in Fibrous Dysplasia Managed with Osteotomy and DHS” at IOACON 2010. 3. Presented Paper on “Congenital Hyperextension Of Knee” at IOACON 2009. 1. Vyageswarudu Gold Medal – presented a Paper titled “Peri Prosthetic fractures of Femur - Is Vancouver Algorithm Still Relevant” in the Vyageswarudu Gold Medal category at TNOACON 2013. 2. Presented Poster Titled “Interesting Presentations Of Exostosis” at TNOACON 2009. 3. Presented Paper on “Giant cell tumors – our experience with surgical reconstruction” in TNOACON 2010. 4. Presented Paper on “Management of Ipsilateral Fractures of Femur and Tibia” at TNOACON 2011. Presented a Paper on “Functional Outcome of Use of Lrs in Defect Non Union of Long Bones of Lower Limbs” at OASISCON 2010. Poster presentation on Atypical Tibial Condyle Fracture with ACL and ALL Avulsion” at ISKSAA 2015. Paper presentation on ” Lipoma Arborescens of knee” in IASCON 2016. Received Winners medal in state level Post Graduate quiz conducted at TNOACON 2010.